NSATA > ATOY > 2016 Athletic Trainer of the Year Voting is OPEN! Becky Wardlaw Nomination #1 It is a pleasure to nominate Becky Wardlaw for the 2016 George F. Sullivan Athletic Trainer of the Year Award. During the past year, Becky has exemplified going above and beyond for the profession, our membership, for those entrusted to her care, and for our public stakeholders. In addition to her daily duties as the Head Athletic Trainer at Papillion LaVista South High School, Becky has been appointed to the Nebraska DHHS Board of Athletic Training as an Athletic Trainer Member as well as being an active volunteer within the NSATA, the MAATA , the BOC, and the Nebraska Concussion Coalition. In addition to the above, Becky has been instrumental in helping the Metro Area Brain Injury Regional School Support Team (BIRSST) Team develop and grow. She has been identified as the Grant Administrator/Lead for the BIRSST grant that is provided by the Nebraska Department of Education to help facilitate the programming and administration of the grant dollars to support the growth and development of Brain Injury Programs in ESU 2, 3 and 19. In this role, she has had both direct and indirect impacts on countless students and student-athletes within the schools in these districts. Becky has represented herself and our professional exceptionally, leading an interdisciplinary group of physicians, nurses, psychologists, counselors, school administrators and athletic trainers. She has afforded them the opportunity to witness and benefit from her clinical, organizational and administrative skills. Equally important, she has identified and demonstrated the skills, qualities and characteristics of our profession and the important roll that athletic trainers play as part of a team of providers and health care professionals. Under her influence and direction the Metro BIRSST Team has gone from being a name on a list to an active group within these ESU’s, providing education, facilitation and serving as a resource to schools, parents and students within this region. It has been a joy to observe and directly work with Becky as she demonstrates a commitment to our profession, to her peers within the NSATA and to the patients that she cares for. She is extremely deserving of consideration for this award and I appreciate the opportunity to provide this nomination. Eric Smoyer is an instrumental force for the NSATA, but his work is behind the scenes and not everyone recognizes how much time and effort he dedicates to our organization. Eric has been the person keeping our website up to date with modern design, usability, and making it a tool to streamline committee efforts. The NSATA has one of the most impressive websites of all the state associations and this is due to Eric’s work. He is constantly working to streamline processes and has improved upon the Hall of Fame nomination, scholarship applications, and a host of other committee activities. His work has saved people time and created easy distribution of forms to multiple people as part of an automated process he created. He also created an online store and learning portal from scratch and has been instrumental in helping advance the Summer Education Conference information and registration process. When an idea is born, the immediate thought is that Eric will have no problem figuring it out and he always comes through. The amount of hours he has spent on projects has been countless! When someone works under the radar like Eric does, it is easy to skip over recognition for them. We’ve done that for many years now and in light of his work this past year, which was extensive, it is time to change that trend. The most impressive thing about Eric is he has stayed true to athletic training, even after completing his physical therapy degree. He continues to serve as an athletic trainer and serve as a role model for good working relationships with other providers. The NSATA is lucky to be the recipient of his talents, in both athletic training and web design and coding, and his passion for our profession. Please consider rewarding Eric’s efforts with the George F. Sullivan Athletic Trainer of the Year award as he embodies everything the spirit of the award is meant to honor. Eric Smoyer is a young professional that has made a name for himself as a “go-to” volunteer in the state of Nebraska and across the Mid-America Athletic Trainers’ Association. Athletic trainers are often known for sharing their talents behind the scenes. Eric Smoyer is just that. Eric has single handedly taken a very broken NSATA website and developed a functional site for NSATA members, peer athletic trainers and the public. Because of his outstanding work, members of the public are utilizing the NSATA website to gain information about our profession and place inquiries relating athletic training services. Due to Eric’s dedication and end product, he was called upon to assist in a complete overhaul of the MAATA district website as well. Both projects were long overdue and Eric willingly took on the challenge. In addition to his work with the NSATA website, Eric has also developed a learning management system to house the NSATA EBP home study program. Few NATA associations have the technology to offer home study programs. Without Eric’s extra effort and problem solving, online EBP CEUs would not have otherwise been possible. As a young professional, Eric stands out as a leader in the profession and for the NSATA. He is timely, knowledgeable and forward thinking. Eric is dependable and exhibits unique leadership qualities. In just a few short years post-graduation, Eric has donated many hours serving our association in updating the NSATA and MAATA websites. A complete overhaul was necessary and a huge task for both sites. Because of Eric’s hard work and dedication to the association’s communication efforts, he has created instant success for association stakeholders. The NSATA website continues to be improved and updated to allow the ability to register for the NSATA Summer Education Symposia, submit ATOY and Hall of Fame nomination applications and NSAA Championships material. Because of Eric’s commitment to NSATA, the association has reached new heights. It is my pleasure to nominate Eric Smoyer, ATC, CSCS, for the George F. Sullivan Athletic Trainer of the Year. I would like to submit this letter of recommendation for your consideration of Eric Smoyer for nomination of the George Sullivan Athletic Trainer of the Year Award. I have worked with Eric the past two years to load information on the NSATA website and have had only positive experiences. Eric has processed hundreds of requests and requests for revisions for the committee with which I am involved. Each year, Eric looks for ways to make processes easier and seamless for the both end user and for the requesting person. Eric processes requests quickly, typically within 12 hours or less of receiving the request. He always is willing to assist in writing copy that is concise and easily understood. Eric communicates via email and in-person. These in-person meetings aid the requesting person in seeing what can be accomplished by using different layouts and methods. Although these meetings can be lengthy, Eric gives freely of his time, ensuring the requesting person is satisfied with the outcome. Eric has played an essential role in the NSATA offering the 0.75 EBP CEU online. 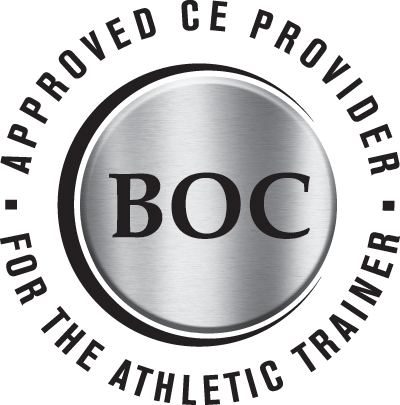 This online EBP CEU required revision in 2016 to align with the roll out of the BOC’s 2016 Standards which allowed NSATA renewal of BOC Approved Provider status. Thanks to Eric’s dedication to excellence, the NSATA has a website which consists of more than just outdated information hosted on a poorly executed platform. Eric is an excellent representative to the public regarding who an Athletic Trainer is and also represents Athletic Trainers well to the Physical Therapy community with his dual credential status. Please accept this letter of recommendation nominating Eric Smoyer for the George Sullivan Athletic Trainer of the Year Award.